John F. Kennedy may have pledged that Americans would put a man on the moon within a decade - but it was only because Lyndon Johnson had told him that it was possible. From the very inception of the space program, Johnson was its most prominent champion, and as Kennedy's vice-president, responsible for advising him on what the nation's space policy should be - a charge he boosted vigorously. As president, he fought to keep the space effort aloft and took a special interest in the astronauts, feting them at the White House and entertaining them at the ranch. He watched, he said, their every movement with pride. 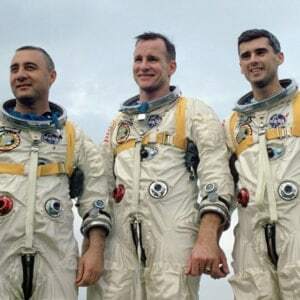 And when, on January 27, 1967, a fire broke out in the Apollo I command module during a training exercise and killed astronauts Roger B. Chaffee, Virgil I. Grissom and Edward H. White, he was devastated. On January 31st, the day he wrote this moving letter of condolence, Johnson attended Chaffee’s burial at Arlington National Cemetery. Some say that the elder Chaffees were too shocked with grief to pay any mind to the president; others say they blamed him for flogging the space program to attempt a manned flight before it was ready, and ignored him intentionally. But what Johnson felt about space, and the astronauts who pioneered its exploration was absolutely sincere, and he gives voice both to his sense of loss and to his commitment to the cause for which Chaffee died. In 1973, NASA’s Manned Spacecraft Center was renamed the Lyndon B. Johnson Space Center. Today it is the site of all astronaut training, the Mission Control Center, and NASA’s scientific and medical research programs. Typed Letter Signed, as president, 1 page, quarto, The White House, Washington DC, January 31, 1967. To Mr. and Mrs. Donald L. Chaffee in Grand Rapids, Michigan. The nation's sadness and the world's compassion are a measure of the loss you have suffered. Yet they are no less a mark of the greatness of the cause to which your son was committed, and the size of his achievements in advancing it. To expand our knowledge of the heavens is to seek a richer life on earth for our children, and generations of children to come. To succeed in that great enterprise we must have men of superior talents, supreme courage and surpassing dedication. Such men are rare, but Roger was among them. He will always be among us, warm in our hearts. He has done more than stretch our hand into space. He has moved us closer to the fulfillment of an ancient dream, and in doing that he has moved all men closer together. Mrs. Johnson and I mourn for you as we pray that God's blessing will dwell with you. May you find strength and comfort in the pride that America shares with you.